Start Clair Tappaan Lodge at Norden 2.5 miles east of I-80. 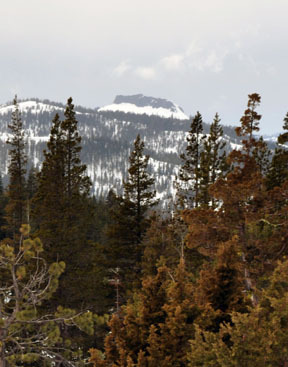 Along this tour you will be treated to a grand vista from Boreal Ridge of Castle Peak, and at more than one place Donner Lake, Donner Peak, Mount Judah and Mount Lincoln will lay before you. As the title of the tour implies, you also pass by three lakes: Azalea Lake, Flora Lake and Lake Angela are situated in a beautiful area rich in granite walls and steep slopes. 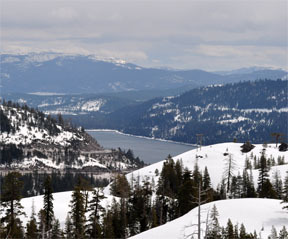 A small rise to the east of Flora Lake affords a wonderful view of Donner Lake, the interstate and the transcontinental railroad — a great place for lunch if the sounds of the cars and trucks on the interstate do not bother you. If they do, eat at one of the lakes. The greater Lake Angela area is barren and the beauty of its starkness is marred only by the power lines that pass nearby. 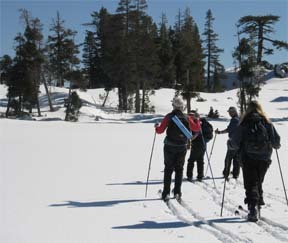 Exercise caution before skiing across the lakes described in this tour. 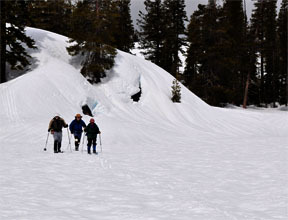 The part of this tour that forms the loop, and includes Boreal Ridge and the lakes, is also visited in the Lakes Crossing Loop tour that begins and ends at the Donner Summit Sno-Park. 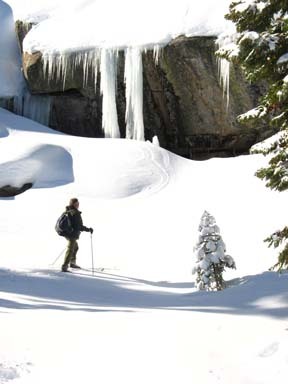 Although this tour begins and ends at the Sierra Club's Clair Tappaan Lodge, you do not have to be staying at the lodge to ski here. 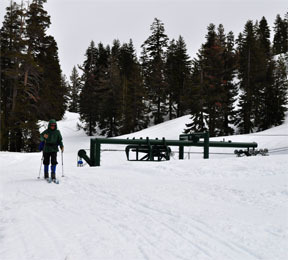 From the trailhead (1) outside the front door of Clair Tappaan Lodge ski north up a short hill and then gradually northeast for a total of 1.0 mile until you reach the bottom of two ski lifts (2) that are part of Boreal Ridge and Sierra Ski Ranch. Be careful, the first hill is used by sledders staying at Clair Tappaan. Ski east for 0.2 mile until you reach a saddle (3). 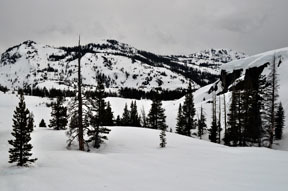 Ski north and then northwest for a total of 0.4 mile until you reach the top of a Boreal Ridge ski lift (4). Turn northeast and ski to the broad but obvious high point on Boreal Ridge known as Peak 7666 (5). This section is not groomed. As an alternative to the route described from the saddle (3) to Peak 7666 (5), you can forge your own route directly north from the saddle to the peak. Descend to the north, then northeast and finally east for a total of 0.4 mile until you reach Azalea Lake (6). 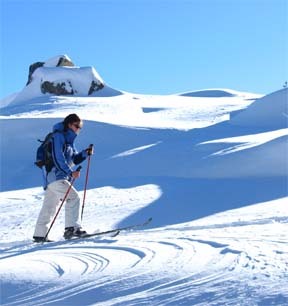 This section contains the most difficult skiing of the tour. Ski southeast for 0.3 mile until you reach Flora Lake (7). Don't forget to visit the top of the rise to the east! Ski south, picking the best route around little obstacles, for 0.5 mile until you reach Lake Angela (8). Ski northwest and then west, climbing most of the way but descending at the very end of this section, for a total of 0.5 mile until you reach the groomed road and route you skied earlier (9). Retrace the route for 1.3 miles back to the trailhead (1).